Left to right: Prof Vishna Devi a/p V Nadarajah, Dean of IMU Teaching and Learning; Associate Prof Kang Yew Beng, Associate Director of IMU e-learning; Associate Prof Sharifah Sulaiha Hj Syed Aznal, Associate Dean of Clinical Learning for IMU Teaching Learning Committee and Mr. Ismail, Vice President of Medicine for Student Representative Council during the 21st Century Learner’s forum. Kuala Lumpur, 18 March 2016 – International Medical University (IMU) celebrated its University Day recently. Established in 1992 as International Medical College (IMC), IMU University Day is an annual event celebrated to commemorate its university status conferred in 1999. The auspicious event was especially meaningful as it comes just a year before the University marks its 25th anniversary as the premier private medical education institution in Malaysia. Among the noted attendees were University Chancellor, Y.Bhg Dato’ Dr Amir Abbas; Pro-Chancellor, Y.Bhg Tan Sri Dato’ Dr Gan Ee Kiang; Board of Governor member, Y.Bhg Prof Datin Paduka Dr Aini Ideris; President of IMU Group, Y.Bhg Tan Sri Dato’ Dr Abu Bakar Suleiman and Vice-Chancellor of IMU Education, Prof Abdul Aziz Baba. IMU’s University Day also marked an especially significant milestone as it comes just months after the university initiated its new Vice-Chancellor of IMU Education, Prof Aziz. With the university now under his wing, IMU seeks to reach even greater heights with a fresh new perspective. “As an established private medical and health sciences university, IMU has always placed a great deal of importance on carving a holistic educational experience. We must produce a future generation of medical and healthcare professionals who are equipped to face the changing landscape and needs of the industry, while nurturing ethical, caring professionals who can deliver safe and effective healthcare services to the community. At the end of the day, we aspire to produce not only highly-skilled professionals but also well-rounded individuals with respectable values and admirable work ethics.” said Prof Aziz. 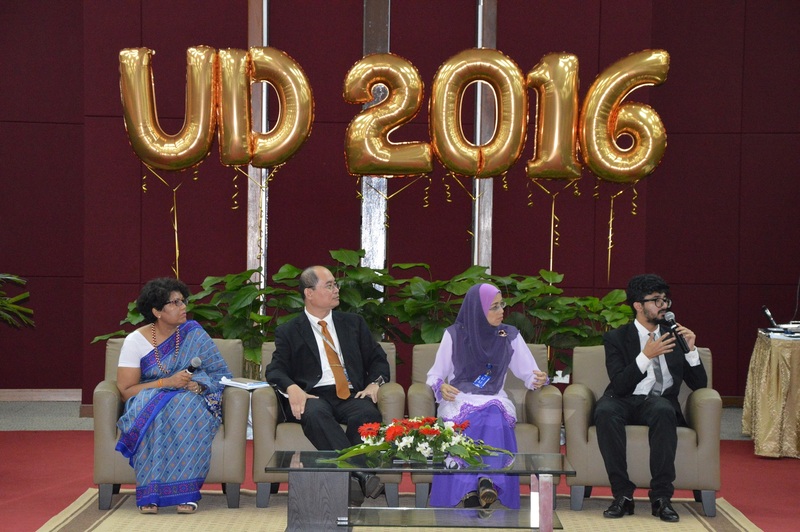 To commemorate the special occasion, several activities were organised for alumni, staff and students including an interactive forum entitled ‘The 21st Century Learner’. Achievements of the university in 2015 were highlighted and various awards also presented to staff members. These awards included the including the Staff Long Service Awards and Achievement Awards. The Aflame Student Award was also presented to honour a graduating student from any of the IMU programmes. The 21st Century Learner’s forum comprised of speakers from various disciplines and was chaired by Professor Vishna Devi a/p Nadarajah, Dean of IMU Teaching and Learning. From the faculty, the first speaker was Associate Professor Kang Yew Beng who is also Associate Director of e-learning; followed by Associate Professor Sharifah Sulaiha Hj Syed Aznal, the Associate Dean of Clinical Learning and lastly, Mr. Ismail, Vice President of Medicine for Student Representative Council who spoke passionately about professionalism. The Aflame Student Award was created by IMU in 2012 to emphasise, reinforce and enhance the importance of humane principles practices among students of a healthcare school. 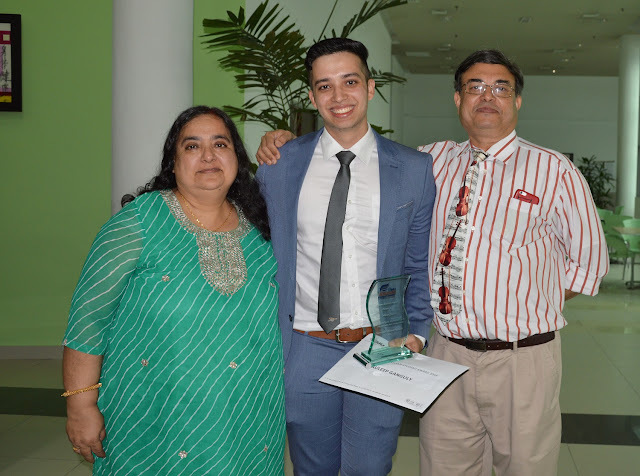 Auleep Ganguly, a Dentistry graduate was the recipient of this year’s award. He was understandably extremely pleased and excited when he got the call. “It’s always nice to have your efforts recognised” he said. “I feel that the process of volunteering for a good cause and helping others is sufficient reward” he continued humbly. Proud parents of Auleep Ganguly, winner of the IMU Aflame Student Award 2016. 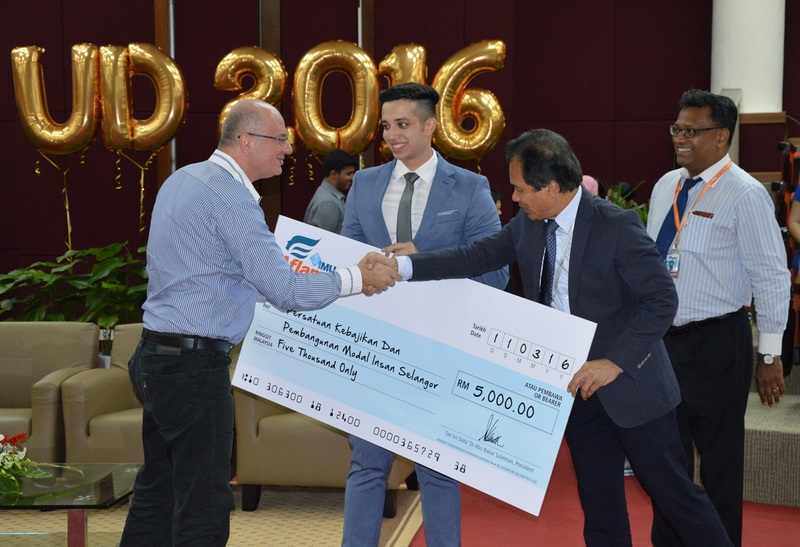 As the 2016 winner of the Aflame Student Award, Auleep was given the opportunity to nominate a beneficiary to receive a donation of RM5,000. Sekolah Al Akhlas an outreach centre located near Batu Caves that tutors Rohingya refugees was the beneficiary and on hand to accept the donation was Mr. Mark Bayoud, a representative from Persatuan Kebajikan Dan Pembangunan Modal Insan Selangor, the organization who will be managing the funds on behalf of the centre. “I nominated them not only because they were in severe need of cash but because they are located in a run-down neighbourhood and are not recognised by the United Nations High Commissioner for Refugees (UNHCR). A cause like this deserves recognition and funding in my eyes. With an education, these children have a chance for a better future,” Auleep elaborated. Mr. Mark Bayoud, a representative from Persatuan Kebajikan Dan Pembangunan Modal Insan Selangor (left) receiving the RM5,000 fund from Prof Abdul Aziz Baba, Vice Chancellor of IMU Education (right) together with Auleep Ganguly (second from left). The IMU University Day also continued the day after with an E-treasure hunt for the students and staff which was won by team Dopamine, with team Bacteria and team Acupuncture as 2nd and 3rd place winners respectively. As an integrated medical and health sciences institution, IMU works with some of the world’s most respected individuals and universities in the field of medicine and health sciences to offer the best quality of education, healthcare and research. The university has been able to provide quality tertiary medical education and confer full medical degrees to numerous successful researchers and health professionals the world over, and will continue to do so for many more years to come. International Medical University (IMU) is Malaysia’s first and most established private medical and health sciences university with over 24 years of dedicated focus in healthcare education. Established in 1992, IMU pioneered the world’s first Partner Medical School programme and has since gained international recognition with over 30 world class university partners in Australia, New Zealand, United Kingdom, Canada, US, Ireland and China. IMU’s main campus is located at Bukit Jalil, Kuala Lumpur with branch clinical schools located in Seremban, Kuala Pilah, Batu Pahat and Kluang. Committed to its brand promise, “Delivering the Future of Better Healthcare”, in 2010, IMU became a fully integrated healthcare institution offering Education, Healthcare services in both medical and complimentary alternative medicine and Research to serve and improve the quality of lives. IMU is part of IMU Health, a subsidiary of IHH Healthcare Berhad (IHH) a leading international provider of premium healthcare services. Known as Asia's largest hospital operator, IHH presently operates over 7,000 licensed beds in 39 hospitals as well as clinics and ancillary healthcare business across Singapore, Malaysia and Turkey, and key markets of the People’s Republic of China (PRC), Hong Kong and India. IHH is also present in Vietnam, Brunei and Macedonia.